With over 20 years of experience under our belt, we have overcome the biggest barrier in order to reach remote unfished areas — the Amazon’s shallow sand bars. We have gone from using the attractive, but ineffective U.S. 120HP high-speed bass boat, to our newly designed, built and field-tested, all-welded aluminum shallow-draft tunnel boats. These boats are 20 feet long with a 40 HP outboard and all the standard bass boat features (trolling motor, high swivel seats, etc. ), yet they are still sufficiently light to navigate the shallow sandbars. River Plates’ guides are undoubtedly the best in the business. Most Amazon outfitters employ poorly-trained, unenthusiastic “boat drivers”. 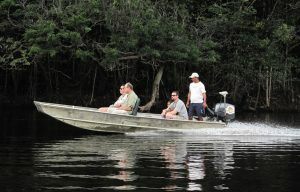 River Plate’s carefully-trained guides are hard-core sport fishermen who are intimately familiar with the complexities of Amazon angling. Many have guided for River Plate for over 15 years. 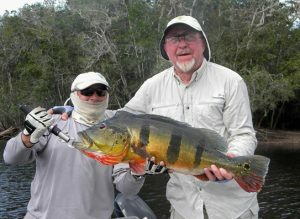 With thousands of fish boat trips for clients, they’ll put you onto big numbers of big fish like no one else in the Amazon. River Plate sponsors a very thorough guide training program with candidates of the local communities.